A few days off. Time to start stitching again. This block, for my June entry in CQJP, has taken months. It has seen a wedding, a couple of trips, and the passing of Mollie Kitty and now the first rains of autumn. I'm glad it's done at last and hope for less eventful times for the remaining 6 blocks. A look at the completed block. As with most blocks, this one started with rickrack and grew as it would from there. The rick rack in this case was bright yellow, to liven what seemed a somewhat dull block. It did the trick and motivated the rest of the block! Next up was this flower filled patch. 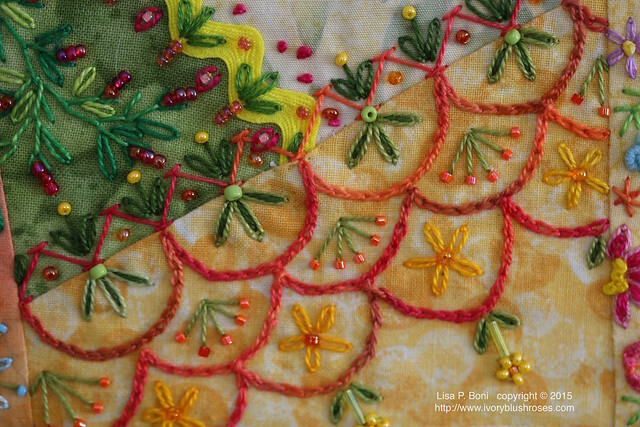 A patch filled with chainstitches clamshells added some brighter orange. 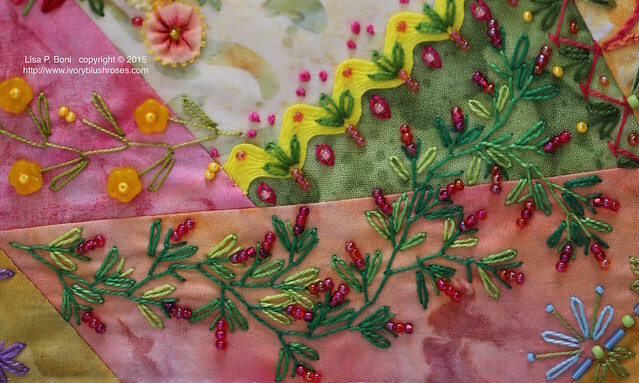 The last seam stitched was this simple feather stitch with yellow flower beads from Florilegium, which were gathered at the CQI retreat in August. 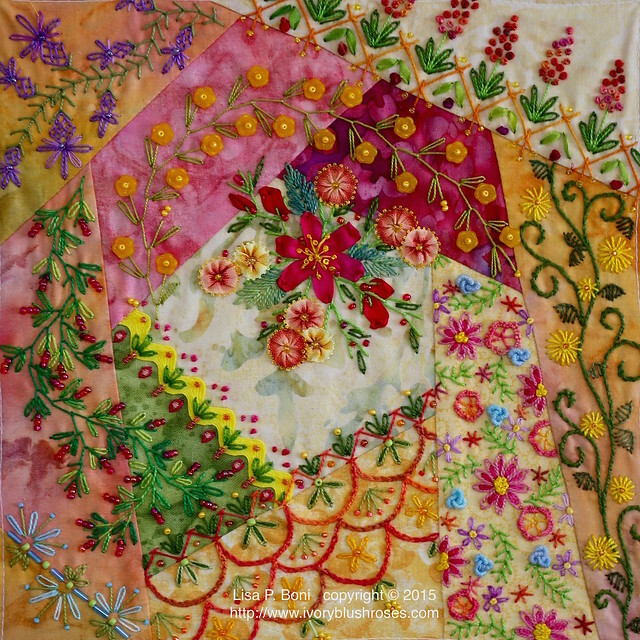 I didn't think I'd use 20 flowers on one seam, but had anticipated using them in floral motifs on several blocks. But this seam begged for their use. I was three beads short, but made do. A curly vine with buttonhole leaves and flowers. Love how the flowers turned out! 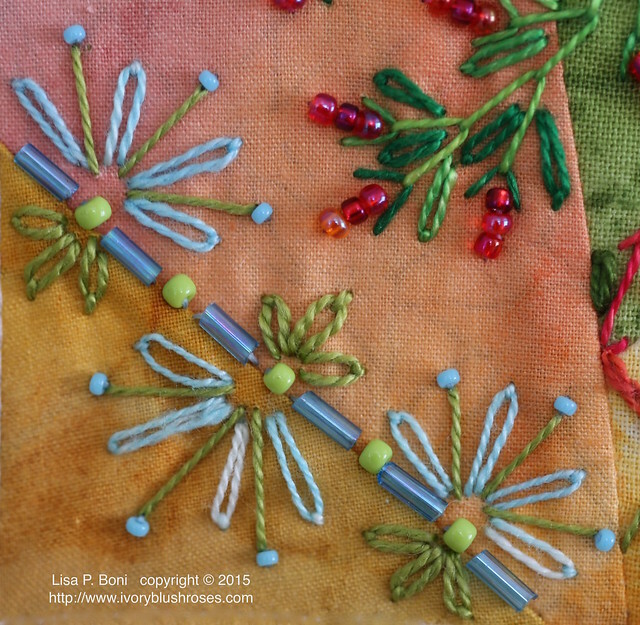 A curvy featherstitched vine with leaves and bead flowers. 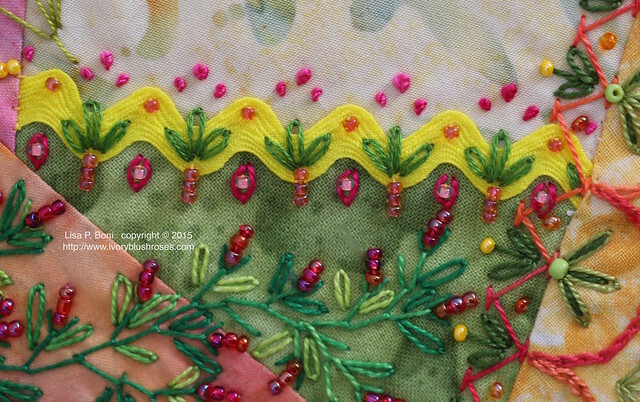 A herringbone seam to fill another corner and spires of french knot flowers. 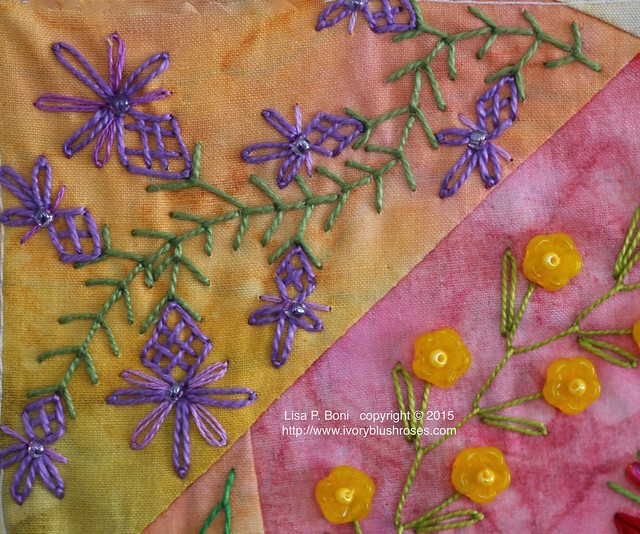 A thistle like seam adds life to another corner and brings a bit of purple into the block. Usually I do the central motif fairly early in the block, but on this one, it didn't happen until nearly the end. 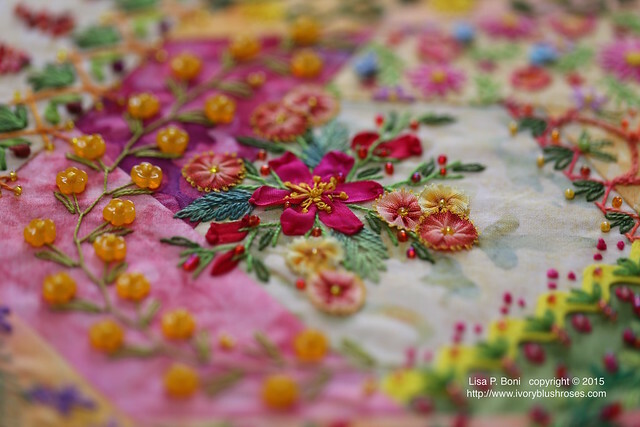 Mokuba ribbon flowers as well as a large silk ribbon embroidered blossom creates this motif. 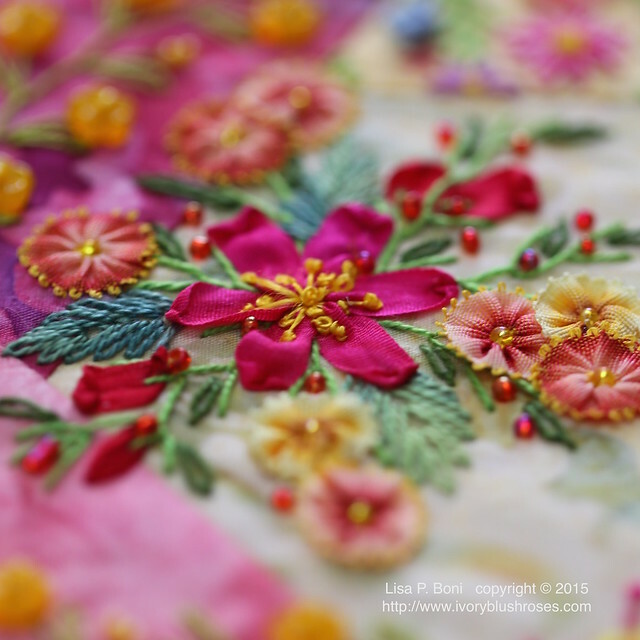 The bright pink of this motif helps to balance the block. Time to move on to July's block! I'd really like to be able to finish this project by the end of December, so must stitch MUCH faster than I have been! Wow!! Just wow! Your stitches are so inspiring! 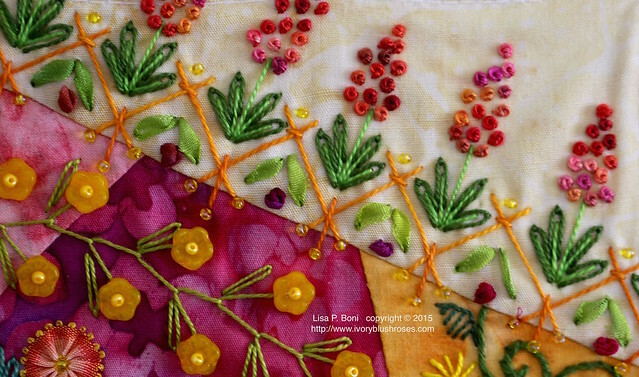 Beautiful Lisa, I especially love the flower field part! Your stitching is so amazing. You are one of my favorite, most inspirational stitch artists. WOW is what I say too! 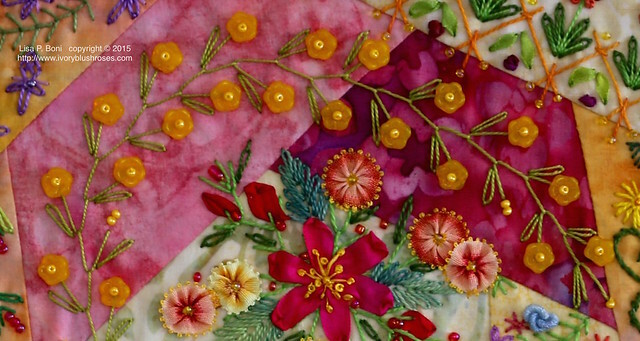 That block is filled with lots of color and your gorgeous needlework. 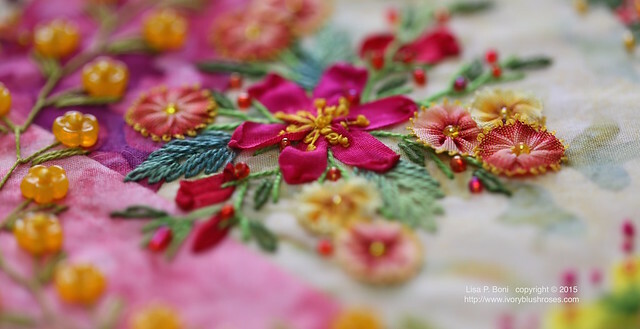 You leave me speechless when I see your beautiful embroidery. My grandmother was talented with her stitching, but this....amazing. I love it! Absolutely beautiful! I have loved all your blocks, and have to return to study them. Don't forget to send this in to CQJP. This is beautiful- well worth waiting for. I just LOVE your creations. Thank you for sharing. Wow, absolutely beautiful. Thank you for sharing your wonderful work. 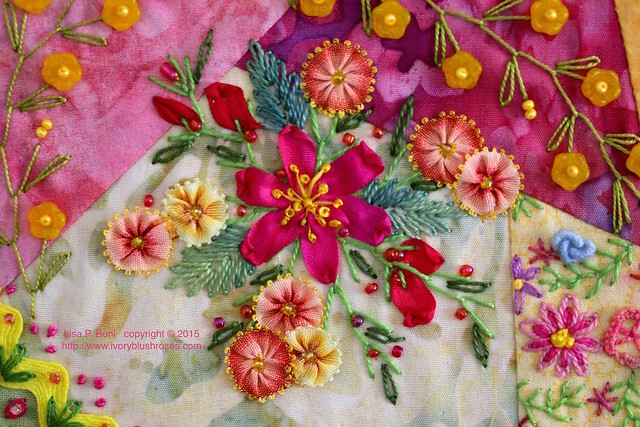 I so enjoy seeing all the embroidery and details you add to your work. Lisa - I must say I broke out in an ear-to-ear smile when I saw your block. It's so happy-inducing with all the bright colours and designs.